As you may know, the invention of the SegWay is due to Mr. Dean Kamen who, noting the difficulties faced by a man in a wheelchair in just climbing a sidewalk, spotted the possibility of a vehicle that could help people to move around without too much effort. Kamen put into practice his idea of creating a means of mobility, that is self-balanced. The first model, called iBot Mobility System ™, was introduced in 2001 and it was a means of transportation that you drove through simple movements of the driver: to curve, you just had to act on a simple knob on the handlebar. This first model was designed for people with impaired mobility and allowed them to move independently even on rough terrain. A following one aimed at people with full mobility, to expand and speed up the movement and the ability to carry small loads without stress, was created right after. 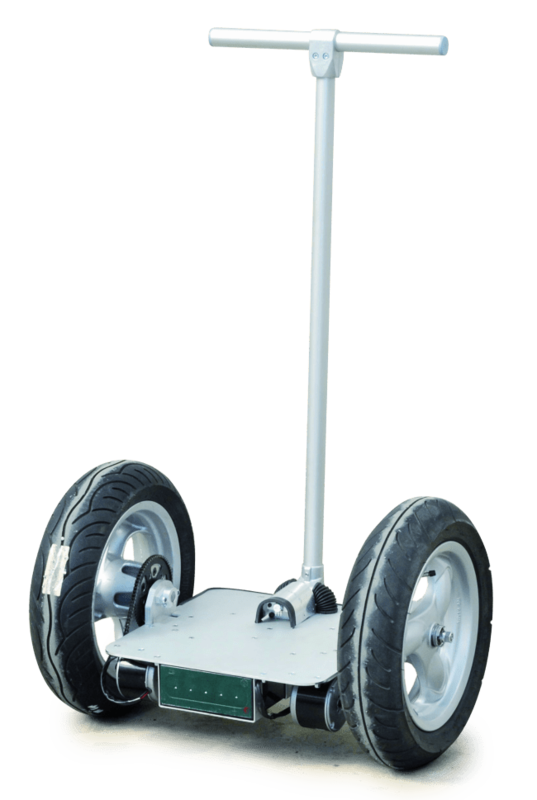 This new model became known as the “Segway PT”, and the system was the first to steer by tilting to the left or right. In 2004 the finally reliable model started to be marketed in the Europe and Asia. In 2009 the ‘British businessman Jimi Heselden Kamen took over the company with the purpose of reviving the image of the Segway and increase sales. Oddily enough, however, Helselden died in 2011 in an accident while hiking with his own Segway. The sale price of Segway PTi2 is mow about 7000 € for the x2: it’s a pretty high price, but fully justified by means of the intrinsic peculiar technological content. 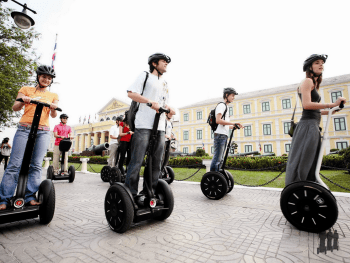 Lately, especially Chinese and Japanese companies, created several similar products, often variations that follow the very philosophy of the Segway, or in other cases with very innovative constructive philosophies. Some have gone even further, creating similar means of transport made of only one wheel. It is basically a structure composed of a platform and two wheels placed transversely driven by two electric motors. The system itself is stabilized by sophisticated electronic circuitry which controls the motors, taking into account not only the movements of the driver, but also the state of the vehicle, allowing it to remain always in a vertical position. The driver standing on the platform controls the running speed simply by moving the steer knob forward or backward, while the inclination to the right or left, allows turns. The mechanism that allows the Segway not to fall down is at same time brilliant and intuitive: engines give power in case you lean forward and less if you lean backwards. Obviously the control board are powered by appropriate motion sensors (similar to those that allow smartphones to change the orientation of the display) to alert the on-board microprocessor constantly on the exact orientation of the vehicle. The real secret of the Segway is not so much in the electro-mechanical part, but in the code that takes into account the physics implemented with a significant mathematical complexity. 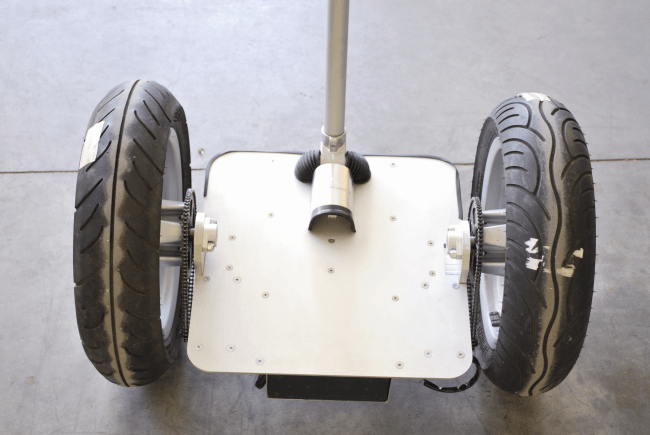 To obtain these relevant features the Segway has two electric motors of the brushless type, made ​​with neodymium-iron-boron materials, able to develop a power output of 1.88 kW, thanks to a battery pack with lithium polymer battery technology. The whole project takes account of the redundancy needed for ensuring safety in the event of failure, by doubling many components: emergency procedures allow in any case the stop and the descent from the same, safely. It ‘s definitely an innovative and highly technological vehicle that justifies the cost, and must be conducted with utmost care and attention, especially when riding in public areas. Please note, in addition, that driving such a vehicle must be always done with the utmost care and in total safety for those who lead and those who are nearby, it is therefore suggested, to adopt appropriate systems for head protection (helmet) and parts of the body more susceptible to falls (wrist guards and knee pads). But now let’s come to the details of our amazing project, which takes its name OpenWheels, for the fact that they are made ​​public, both the wiring diagrams that the firmware, licensed under Creative Commons BY-SA namely: Attribution – Share Alike. Openwheels that can be modified in both hardware and software, optimized and in turn made ​​public as long as new creations retain the same type of license. We will also publish a post that will launch a platform for collaboration on OpenWheels very soon. …the first goal is to find all the electrical and mechanical components necessary to do so, in particular, the two electric motors of adequate power but not too expensive! Initially you have to choose the engine-gear-wheels block and on the basis of this choice the rest of the mechanical and electrical parts will be designed. To simplify the implementation and reduce the cost the engine we choose is of the type with brushes with permanent magnet: it’s typically used in electric scooters and it’s built in China. The engine power has been chosen taking into account the final performance achievable with an eye to the autonomy and the maintenance cost, a value of 250W for both engines delivering up around the 15km/h, with a relatively low current consumption. No motor, however, is able to directly turn the wheels of our Openwheels, this is because, the high number of revolutions of these motors does not allow to get the right traction. Similarly to what happens when you operate the gear of your bike: by increasing the gear ratio, you get a better traction, you lose some speed but you keep the force applied to the pedals depending entirely on your legs, constant. For the wheels, we choose a version with wide tire and alloy rim with a diameter of 47cm. Leaving out the use of expensive gearboxes with gears, the rpm reduction has been realized through the use of a chain and two pairs of geared wheels, one on the motor and one on the a wheel: this method is used both on bikes and scooters. 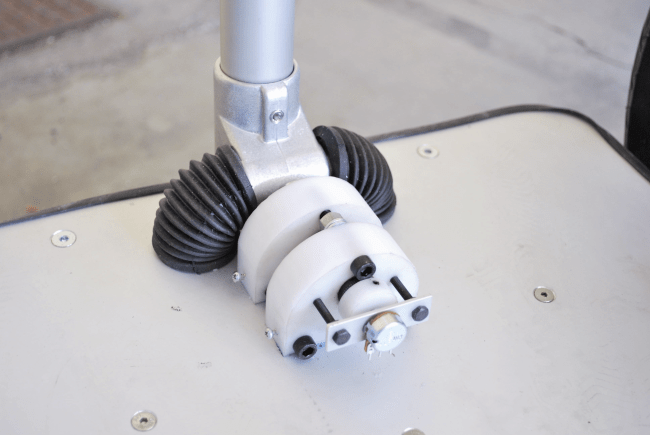 This system is extensively tested and thus will reduce costs, but the big advantage is the possibility to install the footboard in a strategic location. During the development of the mechanical part, curated by Gabriele Draghetta, the platform was positioned below the pivot of the motors. Batteries, the weight of which is quite high, were also positioned below the footboard in a perfectly symmetrical manner with respect the latter, this assures that, with no driver on board, when turned on or off, Openwheels remains perfectly upright. In addition, this intrinsic mechanical stability, will help us in the electronic stabilization, which is necessary when the driver is present. The presence of a person on board inevitably raises the center of gravity above the axle of the wheels thus making Openwheels unstable: this will be solved by the on board electronics. Actual cruise speed will be about 70% of the maximum: it is indeed necessary to ensure a little margin to use the remaining power to change direction, maintain the balance or if necessary, provide extra power to the wheels. Power is supplied by two sealed lead-gell batteries, 12V 20Ah each, manufactured by CSB and placed in series to provide the required 24V engines. It is specific for heavy duty batteries in electric vehicles, capable of deep discharge, contrary to what happens in the normal lead-acid batteries that work in buffer applications. These two batteries are capable of delivering peak current of 130A for 5 seconds and have an internal resistance of only 14mΩ but their best feature consists in allowing deep discharge without damage; as reported on datasheets, with a discharge current between 10 and 20A, the voltage of each cell may slide down to 1.6 volts or 19.2 volts in total. A significant part of the mechanical work needed is due to the realization of the handlebar, which is not rigidly attached to the platform, but allows a transverse rotation movement to approximately ± 30 °. The shaft of a potentiometer is splined on the pivot pin placed near the footboard and measures the inclination of the handlebar. It will be, in fact, the amplitude of the inclination of the handlebar to impart the steering command to the vehicle by varying the rotation speed of the two wheels (as in tanks..woo! ): the speed of the inner wheel will be reduced while the rotation speed of the outer wheel will increase. Assembly is done exclusively by using screws and nuts. Particular attention must be paid to the proper tension to the chain, you can do this by changing the position of the engines, taking advantage of the dedicated slotting the mounting points. The handlebar clamp is entrusted to a single screw, in order also to permit easy disassembly, for easier transportation. Fastening of the batteries takes place via the U-shaped retainers to which a small rubber must be applied to ensure right pressure. We recommend adding the double-sided tape between the battery and the platform so that there is no slippage. 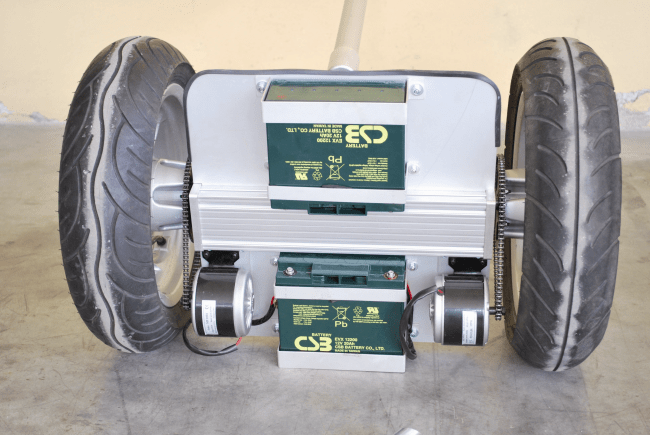 The control board must be inserted between the two batteries and fixed with special spacers to the upright of the wheels. Hi Boris, while this is DIY, and it’s nice that they provide the plans, it is not open source hardware, as the creators retain a commercial monopoly by using the NonCommercial license. See the Open Source Hardware definition: http://www.oshwa.org/definition/ or any other definition of open source. Could you remove ‘open source’ from the title/post? Have you see the other post? I can not see the first post of it!!! What is the model of the LCD used? Is there a version planned for people in wheelchair ? Îm interested in. Congrats for this huge job. I am expecting to do the same. Your openwheel is nice. Tires are not a problem. I am not sure about rim. Grand Dink is not available any more. Could You guys point me to exact model of rim, which I could buy for my project. can the wheels be connected to the motors to avoid the chain? in this case I understand there is no reduction: what is the impact in such case? Have you looked into hub motors, like those in electric bike conversions (e-bikes)? It eliminates the chains, gears, etc. A web search shows that they are available as individual items outside of a kit, but they can have cost, aside from very low-powered ones used in Lego-bots and such. I’m investigating improvements to the InMoov Explorer design, with a motorized center column, allowing for seated height to standing height adjustment in office telepresence situations. Of course, my thoughts are free for anyone to use. I’d just like to see it happen. Just for sake of precision, this is not correct: «The driver standing on the platform controls the running speed simply by moving the steer knob forward or backward». Hi Boris, What is the specific name for the shaft collars you used? i have a segway agency, it’s run good. however, the problem is the battery,how coul we improve it.